Disney Legend Marty Sklar wants to give back to fans and answer these burning questions. When Marty was president of Walt Disney Imagineering, he created a list of principles and ideals for the team, aptly named Mickey's Ten Commandments. Using this code of standards as his organizational flow, Marty provides listeners with insights and advice from himself and dozens of hands-on Imagineers from around the globe. It's a true insider's look like no other! © 2015 Marty Sklar Creative, Inc.
P 2015 Brilliance Audio, all rights reserved. “One Little Spark” Words and Music by Richard Sherman and Robert Sherman © 1981 Wonderland Music Company, Inc. (BMI) All Rights Reserved. Used With Permission. “Meet The World” Words and Music by Richard Sherman and Robert Sherman © 1982 Wonderland Music Company, Inc. (BMI) All Rights Reserved. Used With Permission. “There’s A Great Big Beautiful Tomorrow” Words and Music by Richard Sherman and Robert Sherman © 1963 Wonderland Music Company, Inc. (BMI) Copyright Renewed. All Rights Reserved. Used With Permission. “It’s A Small World” Words and Music by Richard Sherman and Robert Sherman © 1963 Wonderland Music Company, Inc. (BMI) Copyright Renewed. All Rights Reserved. Used With Permission. Academy Award® and Oscar® are registered trademarks of the Academy of Motion Picture Arts and Sciences. ©2015 Marty Sklar Creative, Inc. (P)2015 Brilliance Audio, all rights reserved. I’ll admit I was very excited to read Marty’s latest Imagineering book. However, the majority of this book is a collection of emails from other Imagineers about their various paths to Disney. Still worth the read for any Disney Parks and Imagineering fan. I couldn’t handle him and his overacting. The story couldn’t be enjoyed because I just couldn’t get passed his grating performance. This book is full of anecdotes from the late Marty Sklar that give a great perspective on how Disney Parks are created and it's a fun listen. This book started off fascinating and I couldnt put it down but the last half was drudgery. Way too many quotes. The author should have taken his own advice and known what to leave out of the story to keep it interesting. I liked the Ten Commandments section the best. 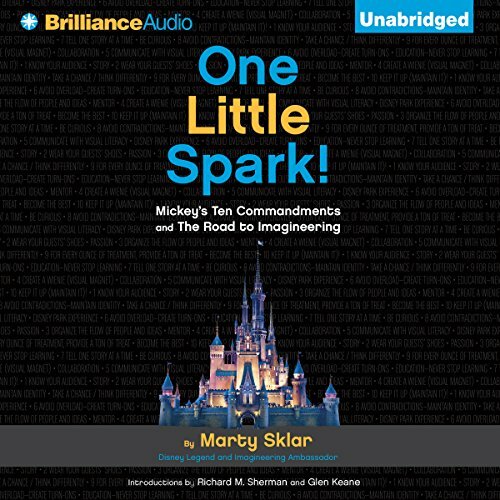 The book works well as a means for Sklar to share advice on professional development, whether your career goals are to be a Disney Imagineer, or success in other areas. I scored down on "story" because the middle was a collection of 1-2 line quotes from imagineers past and present that got a little tedious after a while. Would you try another book from Marty Sklar and/or Jeff Cummings? Less reading email from people that happen to mention what a legend Marty Sklar is and more of how the book begins. It would be more interesting. I don't know how that is possible... Have Marty Sklar sitting in front of a computer reading emails that all have a comment with how great Marty Sklar is and deleting the others? I am a Disney fan and certainly admire from a business perspective what they have done in the parks, and Sklar is one of the few that is still around. It is very interesting to hear the approach to creating this successful theme park enterprise. I also found the book self serving. Sklar has no problem reading things he wrote that say how great Marty Sklar is. Though one of the key messages in the book is TEAMwork, Marty spends much time using the word "I" typically around the great things he has done and the great things people have said and wrote about him. I was hoping for a bit more on Mickeys Ten Commandments. It was interesting. I don't think it gave much hope or clarity for someone wanting to work as an Imagineer. You need to be good at your field, be creative, open minded, flexible and a team player. After you have that- get in line and maybe a dart will choose your balloon. Disney is awesome in so many ways. Need some inspiration? Look no further this book will inspire you to find your own path on your way to becoming an Imagineer!